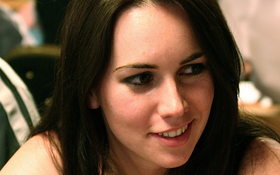 PokerStars continued its push to become the leading sponsor and poker site for female players by adding Liv Boeree to their roster of sponsored pros. Boeree recently parted ways with her long-time sponsor UB Poker, and most in the industry had her penciled in at either PokerStars or Full Tilt Poker. PokerStars now boasts a lineup of female poker pros unparalleled in the poker world: Vanessa Rousso, Vanessa Selbst, Liv Boeree, Victoria Coren, Maridu Mayrinck, Veronica DaBul, Celina Lin, as well as three top female online poker pros, Roxy24, NicP, and marene. PokerStars has also recently launched their PokerStars Women section of their website. PokerStars Women offers female poker players the chance to compete in exclusive tournaments, a number of promotions, information on the female poker pros on PokerStars, access to the poker school, and a number of media outlets from blogs to Twitter and Facebook. This entry was posted on Wednesday, September 29th, 2010 at 8:58 am and is filed under Poker News. You can follow any responses to this entry through the RSS 2.0 feed. You can leave a response, or trackback from your own site.